While visiting my brother in Seattle, we decided to squeeze in a hike while driving back from an overnight trip to Vancouver. 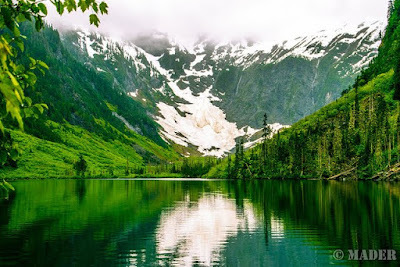 After reading a few blogs and hiking websites, I came across Goat Lake in the Mt. Baker-Snoqualmie National Forest area. 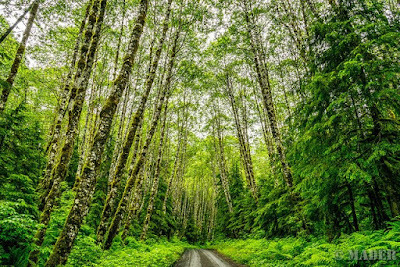 It was a beautiful drive along the Mountain Loop Highway to the Elliot Creek/Goat Lake Trailhead. The highway followed the South Fork Stillaguamish River and the South Fork Sauk River most of the way and there were some pretty nice campsites along the road and stream banks for some "glamping". The paved highway ended and turned into a narrower packed gravel road after a while (near the Sauk River). Turning onto the road to the trailhead we were met with a somewhat rough road that a small car needs to be careful avoiding some large potholes(oops). 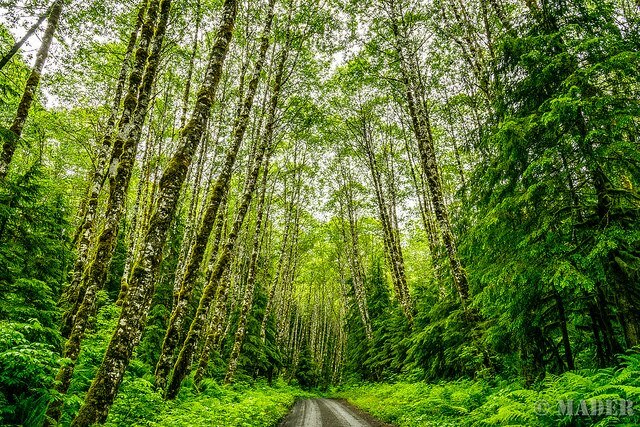 The road was lined with birch trees and was an indicator of what was going to come. The well maintained trail head parking lot had non watered outhouse which was nice and there was plenty of parking. Since we were there in the middle of the week, there were only 4 other cars there when we started. I recently picked up the Suunto Traverse GPS watch on sale and this was my first hike using it. I preloaded a GPS route that I found on Suunto Move Scout app and used that as my guide as well as a map on my phone. After getting it fired up, we were off. Once you get going on the trail, there are two options, a lower trail that follows Elliot Creek and an upper trail. We decided to go the lower going up. It was a beautiful combination of birch trees, moss and redwoods following the creek trail up. 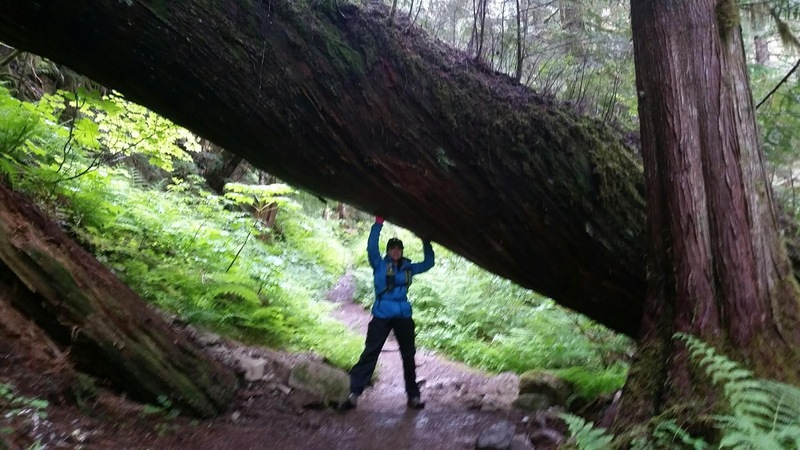 We ran into two hikers who mentioned something about fallen trees, backtracking and an easier hike to the top. We thought we had figured out what they were talking about shortly after passing them, but not so much. 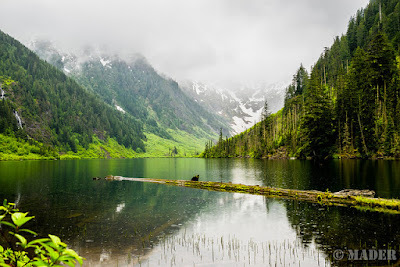 Once you start to get closer to Goat Lake, about 4 miles up and after crossing a rocky creek bed, you start to hear the falls of Elliot Creek. There's a large tree root and the trail switches back suddenly to your left behind you, which apparently is easy to miss. If you keep going straight, which there is a well used trail, you run into the creek and ruins of an old bridge and is a nice spot to hang out. We followed some vague bushwhack trails following the creek up figuring we'd run into the trail again at some point, which we did.This is what the girls were talking about we realized after the fact. You can see my GPS track on Move Scout to see where we screwed up. There are a few signs as you get to the lake about no camp fires and pointing towards a "bathroom" as well as several campsites amongst the redwoods. As you walk up to the lake, there are a few trails that lead down to it. The first one is where it's dammed up from trees and you can probably walk across for a more secluded camp site. As you keep walking, there are better spots to walk down and hang out along the shoreline and take in the view. We snacked and watched the very friendly chipmunks scurry at our feet for a bit before heading back down. We took the high trail back and it was wider and had a nice, gentle grade down. There were several waterfalls and a few decent views along the way. All in all a perfect day hike in the always beautiful PNW.